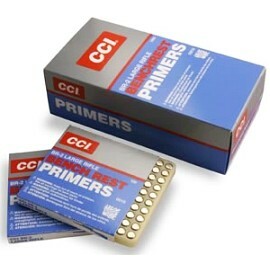 If you’re looking for either the CCI BR-2 or Wolf Large Rifle Primers, Wideners.com currently has both in stock. The CCI BR2 primers (item CCIBR2) cost $42.50 per 1000. 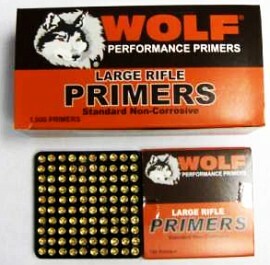 The Wolf LR Primers (item QQQLR KVB-7) cost $29.50 per 1000 OR $142.00 per 5000. Share the post "Primers and Load Velocity: CCI-BR2 vs. Wolf in .308 Win"
A very nice article with a wealth of good, sound advice for the reloader looking for top performance from their loads. I would simply add that even changing lot numbers of the same make of primers ( or powder!) will have dramatic effects on the performance of your ammo. Always, ALWAYS, check and recheck when changing components. It will save you a lot of grief in the long run. This was an interesting article, although the data is statistically insignificant. I combed my reloading records for similar, recent comparisons; they are noted below. All primers and powders were purchased this year and the groups are five shots. My data is also anecdotal. It would be necessary to fire a large number of primers with as many powder types and guns as possible to derive a significant sample population.